The winter wattle is fading, which is a sure sign that Spring is on the way and what better way to celebrate than making a colourful vase to welcome the new blossoms? Firstly, you’ll need about 1/2 bucket of white beach sand. Divide the sand into 8 or 10 lunchbag-sized ziplock bags. The colour needs to be dry. 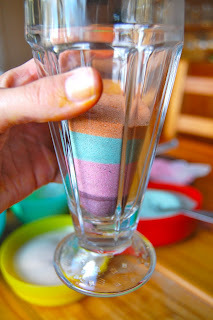 Cake colourings in powder form work well (buy this in little tubs for about $3 each from any good cake decorating shop). This is the dye they use in rolling fondant for fancy wedding or novelty cakes. Powdered paint too, but be careful not to get it wet. Both of these colour types create lovely subdued earthy colours, rather than a bold rainbow. Spices such as tumeric and cummin, cocoa powder and beet powder might be other sources too. Spoon at least one tablespoon of colour into your chosen bag, and shake shake shake until the colour is worked through. 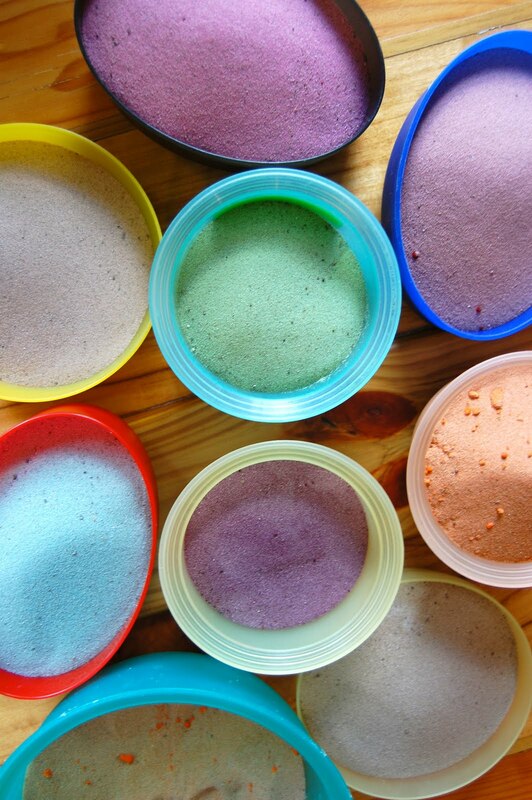 Pour your finished colour into a bowl and seal it with a lid until you need it. 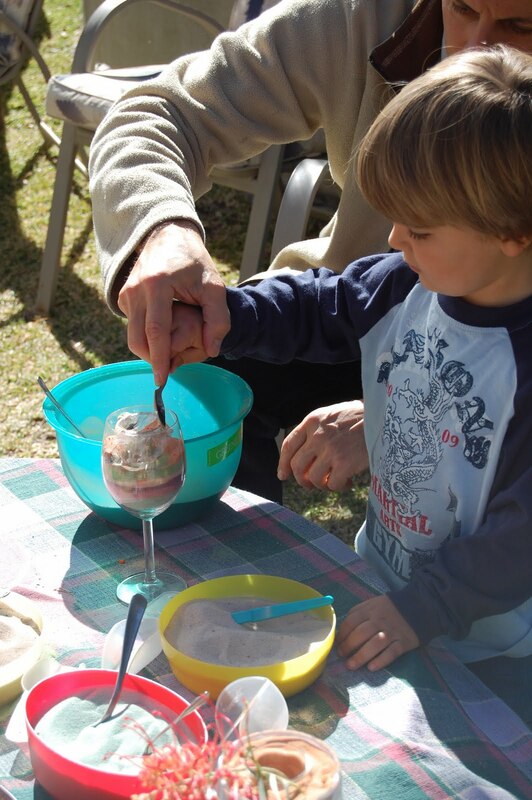 When it is time, set up the bowls on a table with lots of different sized spoons, scoops, and measuring cups ready to help you pour and sift the sand into the vase. Begin by layering a small amount of colour into the vase, then swapping colour again and again. Be sure to wiggle the vase a little in between layers if you want uniform bands, but if you’d prefer a more organic look, just keep adding scooping in sand. Spin the vase a little as you go, or drop one colour only on one side and not the other for a groovy look. When you have filled your vase about half way, you can add in a water holder. We used little ‘shot’ glasses, and rested them on the sand. Keep spooning your colour into the vase, until you reach the top. As you can see, little children love this! And they are really capable too. Can’t you just see the concentration??? 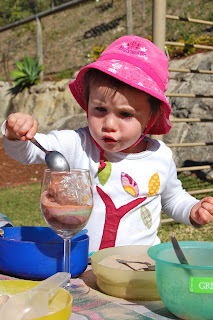 Little C was determined and so focused…. It was a joy to watch her engagement in the activity, oblivious as she was to everything else around her that morning. Our Wednesday Moondew families made their own Spring vase and took it home, covered in glad wrap and sealed with a big chunk of tape to prevent spillage in the car. Now, they’ll be able to display their own sweet spring bloom too. All they need to do is fill the little water holder and place their chosen stems. I’d love to know if you’ve tried this in some way, and have any other tips for colour ?? How else did you display or contain the rainbow sand?? 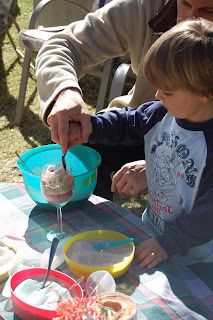 This is so great – I am doing this now with my 21 month old and he is having a wonderful time. 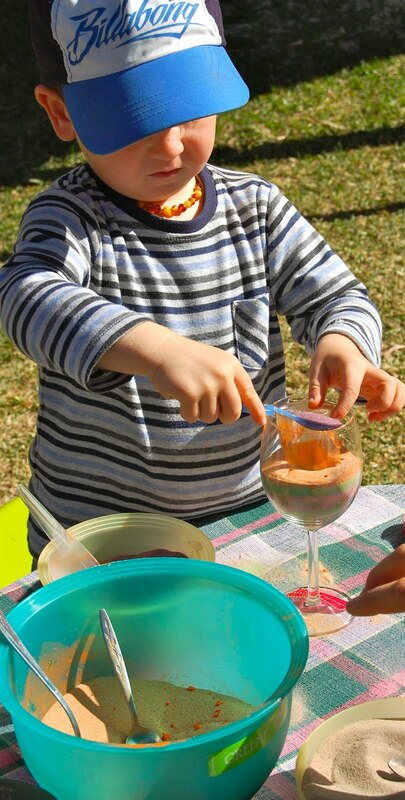 We are using sugar mixed with spices from the pantry (turmeric, paprika, cocoa, cinnamon, green tea powder).he is concentrating so hard getting them into the jar we are using! Thanks so much for this idea Amber! I know, got to love a visual treat! And Veri-tea, I love your sugar colourings… green tea powder, who’d have thought? I LOVE IT!